Urbana’s Ethan Headlee returns a shot during his second singles match against Jonathan Alder on Tuesday at Melvin Miller Park. Urbana defeated Jonathan Alder, 3-2, in CBC boys tennis on Tuesday. In first singles, Ethan Burnside lost, 6-4, 1-6, 6-4. Ethan Headlee won at second singles, 6-1, 6-2. Jacob Coffey won in his third singles match, 6-2, 6-2. In first doubles, Michael Trudo and Riley Johnson lost, 6-4, 6-3. In second doubles, Zach Hoskins and Kyle Rooney won, 6-2, 6-4. On Monday, Urbana lost to visiting Tecumseh, 3-2. Urbana is now 6-4 overall. West Liberty-Salem beat Springfield Catholic Central, 19-1, in 5 innings on Tuesday. For the Tigers, Kayle Henderson was 2 for 4 with a pair of triples and 3 RBI, Hannah Riblet was 2 for 4 with a double and 2 RBI, Arrah Sandy was 2 for 3 with 2 RBI, Hallie Strapp was 1 for 1 with a double and an RBI and Kennah Erwin was 1 for 2 with 2 RBI. The WL-S jayvee softball team improved its record to 5-1 with an 11-8 win over Kenton Ridge. Ally Gaver got the win, pitching a complete game. The Tigers were led by Emily Bolton’s 3 for 4 night. Maddie Hutton was 2 for 4 with a double and a triple. WL-S knocked off Springfield Catholic Central in OHC baseball on Tuesday. The jayvee Tigers fell to Northeastern, 14-4. ENON – Triad defeated Greenon, 16-0, in five innings of OHC softball on Tuesday. For the Cardinals, Kristin Bailey was 3 for 4 with a pair of doubles, Ali Cox was 2 for 2 and Olivia Butz was 2 for 2. Triad (5-2, 4-2) hosts Shawnee on Thursday. JAMESTOWN – Mechanicsburg defeated Greeneview, 12-5, in OHC baseball on Tuesday. The Indians jumped out to an 11-2 lead after three innings and held on for the win. Noah Wolf was 3 for 4 with two doubles, 3 RBI and a run scored. Lane Casey took the win, going 6.7 innings with 5 strikeouts. Mechanicsburg (4-3) hosts Madison Plains on Friday. JAMESTOWN – Mechanicsburg beat Greeneview, 20-0, in five innings of OHC softball on Tuesday. The Indians scored 8 runs in the first and 11 in the fourth to put the pedal down. Macy Reed carried the big stick for the night, going 2 for 4 with a home run, a double and 5 RBI to lead the way. Taylor Hurst was 2 for 3 with 3 RBI, Audrey Ayars was 3 for 4 with 3 RBI, Elyse Wilson was 2 for 4 with 2 RBI and Francys King was 3 for 4 with 2 RBI. Mechanicsburg (6-1, 6-0) will host Madison Plains on Friday. Urbana track and field hosted a tri-meet with Bellefontaine and Riverside on Monday, finishing second in the boys’ events and third in the girls’ events. Winning events for the Urbana boys were Nic Dorsey in the 100 (11.52), Kellen Thomas in the 200 (24.76), Noah Booze in the 400 (53.97), the 4×100 team (46.41), the 4×200 team (1:39.36), Dalton Sexton in the discus (119-05), Nick Agerter in the pole vault (13-00) and Nic Dorsey in the long jump (18-01). Finishing second were Trey Williams (200, 400), Nasir Crochran (300H), the 4×800 team, Kellen Thomas (high jump) and Trey Williams (pole vault). Earning third were Jackson James (800) and Nasir Crochran (110H). For the girls, first place went to Shelby Stoops in the 100 (14.03) and Stoops in the 200 (29.86). Second were Bree Stouffer (1,600), Arianna Cydrus (100H, 300H), the 4×100 team and Mya Canaday (long jump). Taking third were Anna Rogan (100), the 4×200 team, Stephanie Selvaggio (discus) and Kaleigh Bean (pole vault). 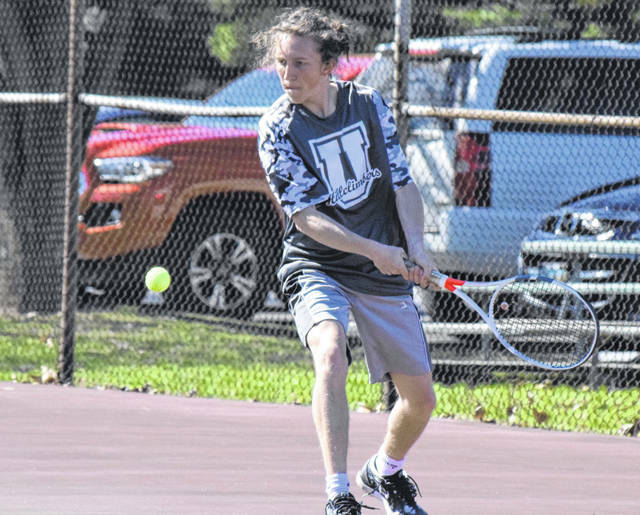 https://www.urbanacitizen.com/wp-content/uploads/sites/36/2019/04/web1_EthanHeadlee040919.jpgUrbana’s Ethan Headlee returns a shot during his second singles match against Jonathan Alder on Tuesday at Melvin Miller Park.